Gunter's has perfected Creamed Honey. Rich, smooth, sweet and creamy. Enjoy this wonderful creamy honey on an English muffin, Toast, Muffin, Shortbread for a morning treat! Makes a Great Dip for Apples and other fruits. Using a Proprietary process of heat and blending, Gunter's creates this wonderful creamy treat. You won't believe it is 100% honey. 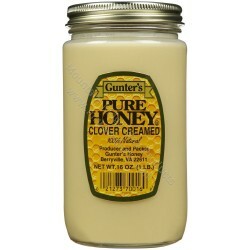 We hope you enjoy your Gunter’s Clover Creamed Honey. The Honey is creamed using a special process that uses no additives to the honey. It is 100% Natural Honey. Due to cooler temperatures or when creamed honey in colder temps it may cause the honey to be too hard for your liking. This is easily adjusted by following the steps below. Place the jar in a pan of hot tap water and allow to come up to the creaminess you desire. It may take up to an hour or longer so please be patient. Store in a cupboard or other dark place to maintain the creaminess and consistency. DO NOT refrigerate. If you refrigerate the honey will become hard. It will not affect the honey but will need to be softened to use. If the honey becomes too soft and creamy refrigerate for a couple hours to get the consistency you would like.